Research Notes Both Clifford Mohr and Wendell Mohr append “Snedker” to beginning of name. This appears to be in error; snedker translates to “carpenter,” his occupation. Emil sang and played violin. He sang with the Danish Harmonien Society (with Alfred Hansen, husband of Thora Mohr). Once sang with world famous baritone Reinald Warrenrath, singing “On The Road to Mandalay” by Rudyard Kipling. Emil was once visited by the Danish tenor Lauritz Melchior, who came to his house and presented him with a gold medal, worn on a chain around the neck, for being the oldest living guard to the King of Denmark. 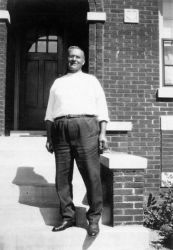 According to 1900, 1910 and 1930 censuses, Emil immigrated to the US in 1886. He is listed as an alien in 1910 and naturalized in 1900 and 1930. [S28] Church records for Frederiksberg parish, København, Denmark, Fødte Mandkiøn, p69, Film #0048191. [S74] Obituary of Emil Frandsen. [S126] Database of Illinois Death Certificates, 1916-1950, Illinois State Archives & Illinois State Genealogical Society, certificate # 0016296.